While Sony just released a new smartphone at MWC to accompany the few Xperia phones that can be used exclusively with its real time photogrammetry app 3D Creator, Qlone just started supporting a whole lot more handsets with the introduction of an Android version. Many people have asked if I could do a proper review of Qlone but until know that was impossible since I’m an Android user and only have an old iPad mini 2 and iPhone 5S in the office. The former doesn’t work with Qlone at all and the latter clearly isn’t capable enough for solid testing. If you have a newer iPhone (I believe that everything from an iPhone 6 up should work well), you can download the iOS version of Qlone here. 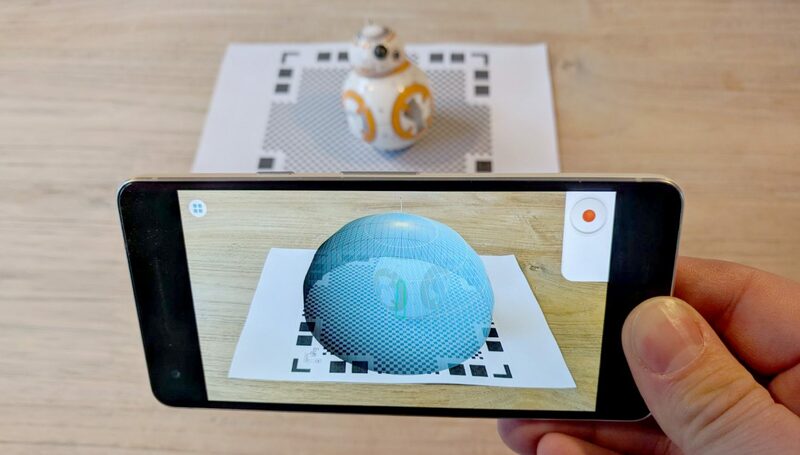 The new Android app currently only supports ARCore capable phones and is labeled as a preview version. I gave it a try on my Pixel 2 and it works but only the scanning feature seems to be included at this moment. I couldn’t edit or export the result. According to the Qlone homepage support for more devices and missing features will be rolled out in the coming weeks. So I’ll wait a little longer for my review. I will be in Barcelona on Wednesday to visit MWC and Qlone is also present there. I’ll visit them to have a chat about their future plans. Follow me on your favorite social network for updates from MWC 2018.